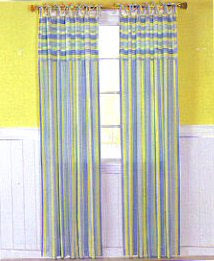 NOTE: After I wrote this blog entry, I found that Sewing.org offers how-to instructions for making basic curtains and more on their Guidelines for Sewing page. 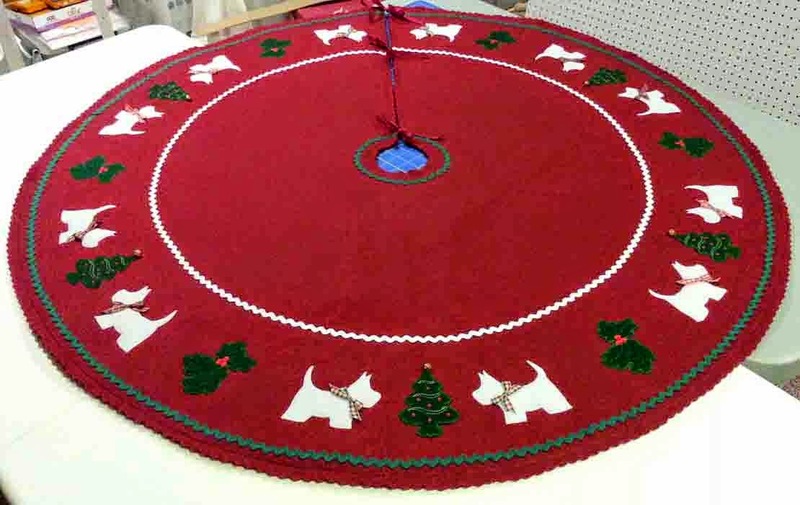 Here's the story of a project that's been languishing in my sewing room for nearly a year. The short version is that I decided I wanted a new look in our master bed and bathroom, brighter and more cheerfully blue. We have several framed prints that we brought home as souvenirs from our various trips to Bermuda, which I decided to use for inspiration. 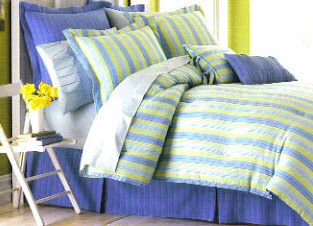 Last summer, I found some ready made items from Liz Claiborne Home in the clearance bin at the local Linens 'n Things, but since this line called "Bridget" has been discontinued, the selection was limited to a bedskirt, a few Euro sized pillow shams and two tab top curtain panels. Soon after, I picked up a "quilt kit" last June at a quilt show and decided I'd make my own "non-quilters'" bed cover. The colors from the kit coordinated with the purchased panels and bedskirt, but were not too matchy-matchy. And that's where the project stalled last year. Except that I did put the skirt on the bed and bought two Euro sized pillows to see if we actually liked the new blue. We do. I don't know why I didn't do this sooner -- the colors are a much better match to my framed art already on the walls. 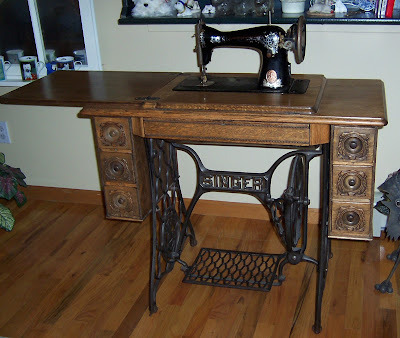 Fast forward to earlier this June, while my sewing machine was in for a "spa" day -- I took it to a new-to-me Viking Sewing Gallery for maintenance because it had problems with tension, needed a good tune-up and also an upgrade to cut jump threads during embroidery. So now my Designer SE is upgraded to the equivalent of an SE Limited Edition, except for the blue button lites and the silver upper cover thingie (which I wouldn't want in silver anyway). Anyway, while the machine was away, I had time to clean up and organize my sewing area and came across the tab top curtains, still waiting to be cut apart and re-worked to fit my 3 windows in the bed and bath areas. 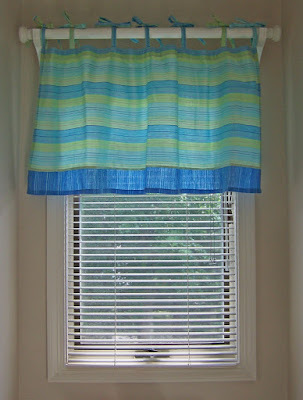 But first I'd need to open a few seams, measure the available yardage and then cut and piece together the new valances. I spent several evenings ripping seams and pulling loose threads. It was tedious and time-consuming, but it allowed me to stay up late and watch the Mets playing on the West Coast and still be a little distracted (so it didn't distress me so much when they lost all those games to the Padres . . . wah!). 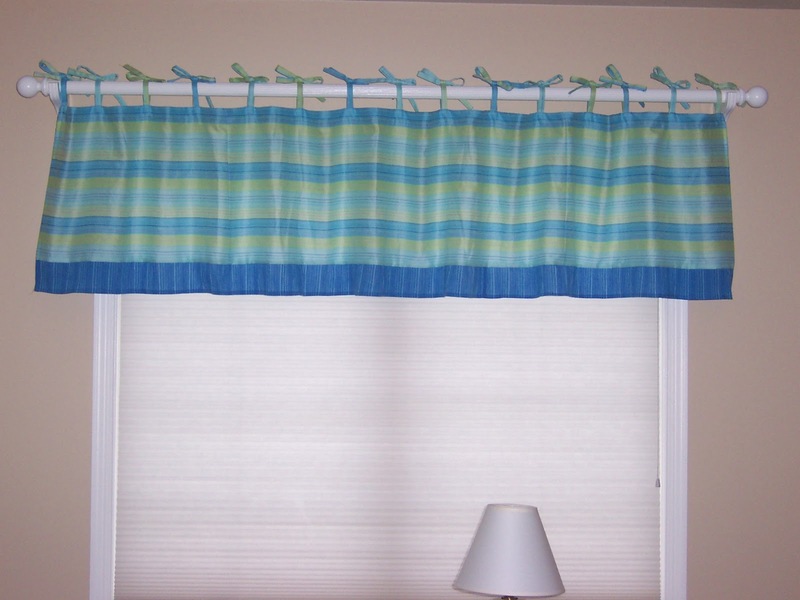 I took apart the two tab top panels, keeping the top horizontal striped section intact and removing the vertical striped sections to cut, piece and create additional valances. 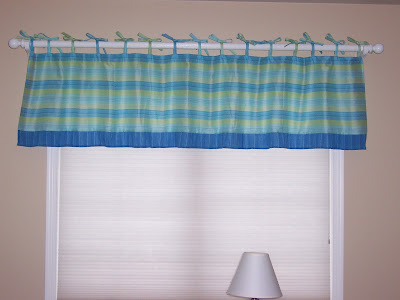 I also removed one long section of an extra twin bedskirt, which I used as a border on the hems of each valance; they needed a little extra blue to tie into the bedskirt and shams. 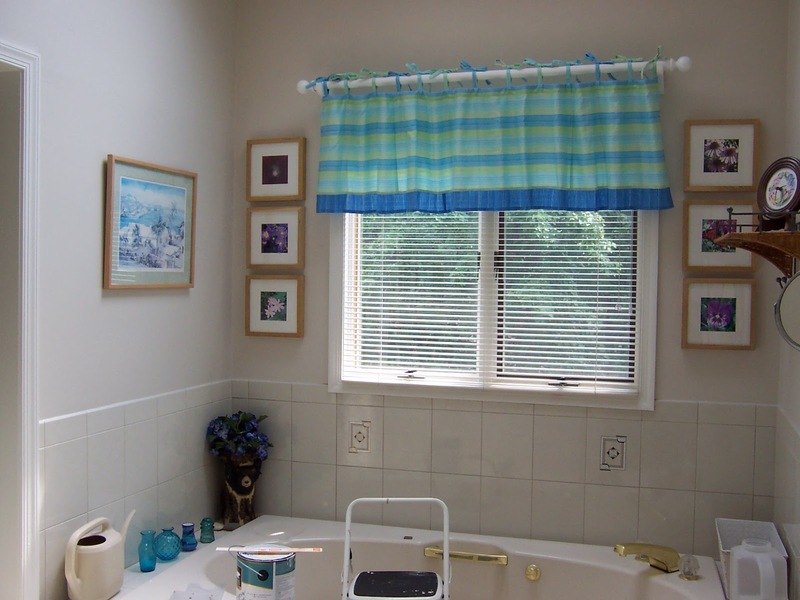 The first valance for the master bathroom small window was done easily enough. The original tab top of one panel fits nicely on the smallest window. All it needed was a good ironing, a border strip and a hem. Next, I pieced the other two windows together, added the blue border strip and additional tabs. Of course, I had to get new rods and hardware to complete the look. I wanted simple white wood rods with simple white finials and white brackets. I found them at two different Home Depots -- the rods and finials were at one store and the brackets were at another. And I had to buy the rods much bigger than needed and used the chop saw to cut them down to size. Fortunately, most of the new hardware fit into the existing holes in the wall from the old curtain rods, except for the small window. I had to make new holes in the wall and patch and paint the old holes. I've been looking for new bathroom rugs and some bright new towels. I found some bright blue bath rugs at Kohl's and so far I'm liking how they coordinate with the valances while repeating the blue. Now I think I need a display shelf for my collection of blue and green glass vases . . . but that's a project for another day. I'm going to have to get started on that quilt soon . . . I don't know how you do it. I can't sew if my life depended on it. 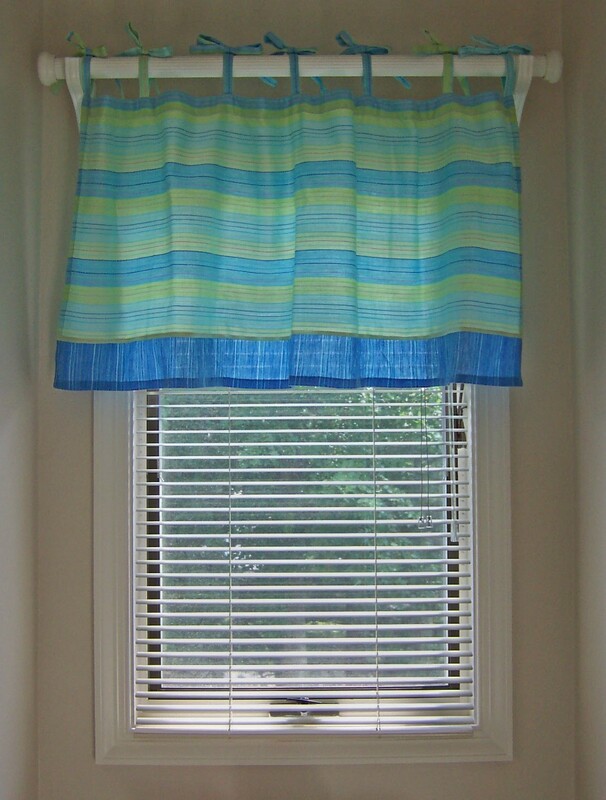 I just spent like $400 on some Priority Windows custom valances last week. It sure is burning a hole in my wallet, but at least you get what you want right?